The decision about whether to adopt mandatory life jacket laws for rock fishers in NSW will be left to each Council (image: Mick Fletoridis). THE NSW Government today announced coastal councils now have the opportunity to opt-in to mandate the use of lifejackets while rock fishing. 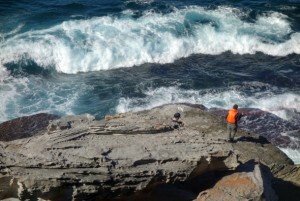 Following a 12-month trial of the Rock Fishing Safety Act 2016 (RFSA) in the Randwick Local Government Area, the Government commissioned an independent evaluator to assess the implementation of the RFSA and suggest options for the future. The evaluation included observational data from enforcement officers, fatality and rescue data, a multilingual face-to-face rock fishing survey, and more than 700 public submissions and online survey responses. Minister for Emergency Services Troy Grant and Minister for Primary Industries Niall Blair announced the next phase of the RFSA, will include an immediate review of lifejacket standards, and the reallocation of the RFSA to the Minister responsible for fisheries, subject to the approval of the Governor. Mr Grant said the NSW Government can’t be at every rock ledge, though it is committed to working with the community so more anglers return home to their family safe and well. “Rock fishing safety can be improved but we need everyone working together: community, local government and state government agencies,” Mr Grant said. “We know there is demand for the law in other coastal areas. Any additional declarations will only be made at the request of local councils, as they have detailed knowledge of their communities and share enforcement responsibility. Mr Blair said many rock fishers are already wearing life jackets but some jackets don't meet the Australian Standards. “Fishers have told us they want rock fishing jackets that meet international standards to be approved for use in NSW. We have listened and will be assessing their suitability,” Mr Blair said. “The Department of Primary Industries will lead the program from now on and we want to work closely with our fishers and local councils that opt-in. Councils that elect to opt-in to the law will be provided with support including up to $30,000 each from the Water Safety Fund and a tool kit that has been created with the assistance of Randwick Council that includes educational materials and signage. The review of life jackets, to be conducted by Roads and Maritime Services by summer, will seek to identify additional international standards that also meet the same quality and performance standards set under the Australian Standard. The NSW Government will also continue to collect data to ensure enforcement and education initiatives are targeted effectively.